If there’s a way to heat up your pool during the offseason and enjoy warm pool water when everybody is closing it, it is by using swimming pool heaters. Among the top brands in the market, you can find Raypool Pool Heaters. This brand offers a wide array of heat pumps, gas pool heaters, and other useful water heating devices. There are many brands of swimming pool heaters in the market, but not all of them will be worth your money and time. We think it all comes down to the brand and reputation, and for us, Raypak pool heaters are easily some of the best to choose. When it comes to water heating devices, Raypak delivers the quality you would expect. From its gas pool heaters to the heat pumps, this brand knows what it is people need and what people go after. Let’s see should you buy a gas-powered heater or the heat pump – operated by the electricity, by checking out the pros and cons of both types. Both heat pumps and gas pool heaters are excellent for heating up pools. However, both come with different advantages and disadvantages, as well as budget needs, ease of use, features, efficiency, and performance, durability, and so on. Normally, a gas heater is much more effective, heating up pools even in winter for longer periods of time, while keeping the water temperature constant no matter the outside temperature. But they cost more money to maintain and to fuel up. 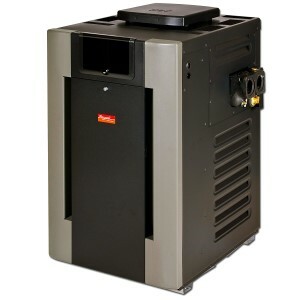 While heat pumps need little to no maintenance and operation costs are really low, they don’t heat up as effectively and fast as gas type, but they are the most cost-effective solution. What do Raypak pool heaters offer? Whether it is for an above-ground pool, a spa or an in-ground pool, the 156A gas pool heater from Raypak will keep it warm without problems, climate or temperature change. Offering 150,000 BTU and a reliable build with top-notch performance – it is an option not to overlook. Mostly useful for its extremely compact yet reliable design, the gas model 106A from Raypak delivers all the efficiency you need. It is one of the smallest in the market, so it is extremely easy to install and transport when needed. When you add the 105,000 BTU, it’s an almost perfect device for above-ground small-sized pools. Offering from 200,000 up to 400,000 BTU in four different models, the Raypak 207A, 267A, 337A, and 407A are magnificent devices to have at home. They will keep your small, medium and large pools warm accordingly and offer a superb efficiency and reliability throughout the year. Being able to use your pool at any time and any season is an advantage Raypak pool heaters offer. The set of heating devices from 206A, 266A, 336A up to 406A are simply amazing for this. With different BTU measurements from 200,000 to 400,000, the water in swimming pools gets warmed up fast and with the steady temperature, no matter the weather changes. The heat pumps from Raypak are also exceptional. The 2450Ti, 3450Ti and 4450Ti are also high-quality models, delivering effective heating capacity with DuraSteel cabinets that promote a long lifespan & reliability. They come in models from 48,000 up to 80,000 BTU. Coming in 6 different models from 103,000 up to 137,000 BTU – the 5450Ti, 6450Ti and 8450Ti are designed to heat up small and medium-sized pools. With their exclusive DuraSteel cabinet and top-notch composite base, these are also one of the most durable and reliable in the market. Top selling Raypak pool heaters reviews! Raypak R336A as the natural gas heater comes with the gas input of 336,000 BTU and it offers one of the most effective performances in the market. It will keep your pool warm even at the harshest of environments, with superb microprocessor thermostat, digital display for easier use, and reliable spark ignition system. The easiest to install a heater for many users, most confirmed the device as a plug-n-play style due to its effortless setup. The design of the device is also user-oriented for easier operation, and many customers loved the hard casing which delivered a highly durable and reliable product entirely. A few users just complaint about the circuit board, which tends to stop working after a few months of use, but overall the device performed amazingly. Providing the easiest installation methods and one of the most convenient constructions, Raypak 156 A with the power of 156,000 BTU will help you warm up your small or medium-sized pool without problems. It is reliable entirely, comes with a resistant build, provides the perfect ignition system, and it is very easy to use as well. One of the things that highlights this water heater is the ease of installation. Despite having to be careful about several factors such as pressure and the perfect gas delivery, users had a very straightforward installation process. When it comes to performance many users were more than happy with the results, as it heats up 3 degrees every hour – which is more than enough for a cozy experience. And the gas bills over a long period of time weren’t too high, so users could receive a reliable device with excellent performance for an acceptable operating cost. However, some users complained about the device having a “rollover switch open” error. This error could only be fixed by a technician after charging a high fee. But overall, there weren’t many things to complain about. Why Buy Raypak Pool Heaters? Raypak is a brand that has been on the market for years. This makes each copper heat exchanger heater magnificent choice without a doubt. Apart from that, Raypak always keeps innovative products in check. Clients love their heat pumps and overall swimming pool heaters catalog. In addition, the quality standards are always there, keeping products not only efficient and performance-oriented but also reliable and long-lasting. Want the best swimming pool heaters at home? Raypak pool heaters will easily fit your biggest standards. From gas pool heaters to heat pumps, these water heating devices are just amazing. Come and see why!